cityWALK is an initiative to encourage, promote, cajole, wheedle, drive and, ultimately ensure a pedestrian- and bike-friendly path through the new development area under the old I-195. As the planning and discussing go on, it has developed into a well thought-out plan that links Fox Point across the Pedestrian Bridge through the Jewelry District over I-95 and on via Elmwood to Roger Williams Park. Download and read the cityWALK (.pdf (1.4 MB)) plan. Thoughts? The City has a similar concept in mind utilizing Friendship Street rather than Clifford Street and perhaps making it’s way to Prairie Avenue to reach CCRI and the Hosptials. 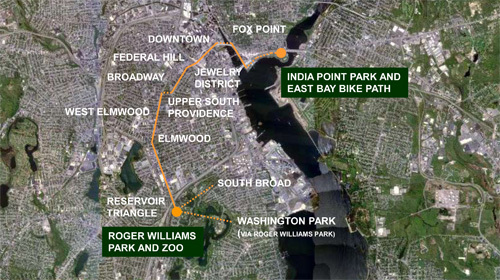 The City plan does not plan the system all the way from Roger Williams Park to India Point Park. This would be a very thin linear greenway, in many areas simply a wide sidewalk with trees. What types of interventions and amenities would be good to go with a system like this? Good start, but could certainly stand to be more ambitious, especially since most additional interventions could be done inexpensively (I’m thinking of Sadik-Kahn’s interventions in NYC). Certainly, getting a better way for doctors to walk from the hospital to the Jewelry district is a great goal, but how about walking/biking to the train station? 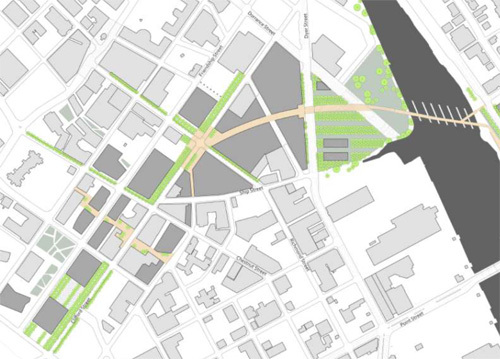 Why not extend this cityWALK proposal from the India Point Park terminus north along the eastern edge of the Seekonk under the bridge and ramp and next to the ball fields to Butler Avenue and beyond to Blackstone Blvd to the Pawtucket city line? There could be a network of similar walks linking the entire city. From RWP it would be easy to extend the walk east to the shoreline and on down into Pawtuxet with lots of upper Bay views… maybe even on down to Rocky Point. Raised or otherwise textured crossways and crosswalks to better distinguish vehicular traffic from the pedestrian throughway.